1Lt John M. Stuermer (P)(KIA) - First two mission flown as CoPilot with an instructor Pilot. 2Lt Charles E. Reynolds (CP)(KIA) - Did not fly on the crew's first five missions Substitute CoPilot's used. 2Lt William A. Tielman (N)(KIA), 2Lt Clyde D. Newman (B)(KIA), S/Sgt David W. Harris (E)(KIA), S/Sgt Edward F. Murray (R)(KIA), Sgt Joseph Stark (BTG)(KIA), Sgt Marvin A. Carroll (LWG/RWG)(KIA) and Sgt Marvin B. Collins (TG)(KIA) - All combat missions with the Stuermer crew. Sgt Lee E. Burch (RWG) - Flew on the Stuermer first three missions (88, 89, 90). Was removed from the crew and flew no other combat missions. A substitute waist gunner was used on the other twelve Stuermer crew missions. Sgt David I. Miller (RWG)(B/O) - Flew as a substitute waist gunner on two Stuermer crew missions (# 108 and 111). Was able to bailout and survive on mission #111. Flew on ten additional missions with other pilots (#125, 126, 127, 129, 130, 132, 135, 136, 137, 139). 22 February 1944, Mission #111 to Aschersleben, Germany in B-17G #42-38041 Hell's Angels II (358BS) VK-D. Crashed at Irthling Borough, England following a mid-air collision with B-17 #42-31516 384th BG(H) while assembling. Was cut in two at the rear door position. 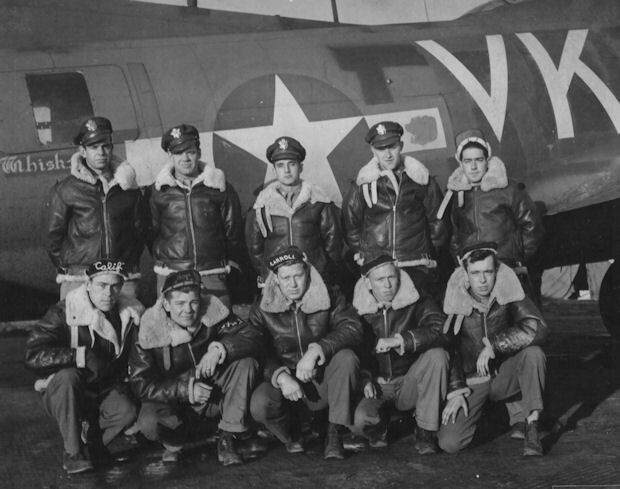 Substitute waist Gunner Sgt David E. Miller bailed out and survived. All other crewmen were killed.